Prominent & Leading Manufacturer and Exporter from Coimbatore, we offer Food Processing & Packaging Machinery such as Automatic Powder Filling & Packing machine, Continuous Band Sealer, Paste /Cream Filling Machine, Basundi Making Machine, Bhujia Making Machine, Chilli Sauce Making Machine and many more items. Packaging machines are used to package products or components, including equipment that forms, fills, seals, wraps, cleans and packages at different levels of automation.Leveling and filling compounds are used to level surfaces, fill cavities, and shim or set machinery. They often have filling and sealing properties. 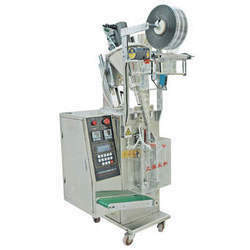 Filling machines and packing machines fill containers such as bags, bottles, and cans with a predetermined volume of product, such as food, cosmetics, or medicine. 1.Steam jacketed vessel having all contact parts of best steel. 2. Our machine shall incorporate fitting like ARV, SRV, product outlet valve, strainer, steam trap, pressure gauge etc. 4. The machine is fitted with geared motor . Bhujia Making Machine uses for safe food items, all the contact parts in it are constructed out of food grade 304 type stainless steel. There are mild steel angled frames structures for supporting the machine. 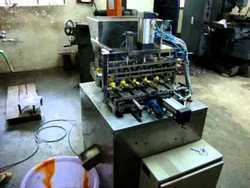 Widely used for making different flavors of bhujia, the machine can be also installed for making jhuri and gathia. You can get this Bhujia Making Machine from us at competitive prices. Chilli Sauce Making Plant is manufactured with the best Raw Materials and Components. Our expertise has enabled us to design and fabricate Chilli Sauce Making Plant in different specification to cater to the growing demands of our Patrons. We design the Chilli Sauce Making Plant in order to make different types of sauces, ranging from tomato sauce to chili and mustard sauce. Clients appreciate our Chilli Sauce Making Plant for features like smooth performance and low maintenance requirement. For churning out the best output, we manufacture highly advanced sophisticated Chilli Sauce Making Plant that is easy to operate. 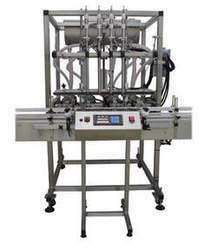 Sauce filling machines provide a clean, consistent method for filling containers to the same cosmetic fill level. 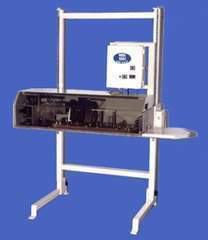 Your bottling machinery is custom built for your specific application and budget. We specialize in manufacturing pickle machines which are very easy to operate and help in making the most relishing pickles in a hygienic process.Pickle Mixing Machine that is available in various models, sizes and specifications at market leading prices.With the aid of modern tools and sophisticated technologies, we have been able to provide the customers with a comprehensive assortment of Pickle Mixer. .
We are a leading Manufacturer & Exporter of Sweet Making Machine such as Soan Papadi Making Machine, Halwa Machine, Sugar Mixing Machine, , Rasgulla Bharai Steam Kettle and Ladoo Making Machine . We manufacture these machines focusing on the requirements of our customers making use of optimum quality stainless steel and latest scientific technologies. These are admired for their precise design, effective usage and longer functional life. 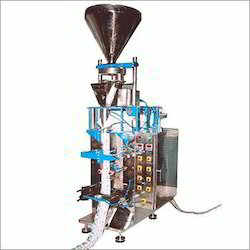 This machine is a Semi-Automatic Piston Type Filling Machine and is suitable to fill thick viscous liquids with granules or pieces like Sauce, Pickle, SalasaThis machine is a Semi-Automatic Piston Type Filling Machine and is suitable to fill thick viscous liquids with granules or pieces like Sauce, Pickle, SalasaThis machine is a Semi-Automatic Piston Type Filling Machine and is suitable to fill thick viscous liquids with granules or pieces like Sauce, Pickle, Salasa. 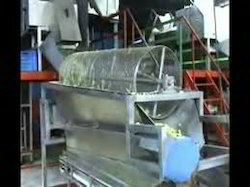 Automatic Pickle Filling Machines which are precisely built and are famous for long service lives. Further, these fillers are developed from sophisticated technology and are used to dispense pickles into bottles or pouches. These machines are available in various specifications and are capable of packing 100 Grams of pickles to 1 kg with a single . We charge reasonable rates for these products Leading Automatic Pickle Filling Machines, Cut Mango Pickle Filling Machine, Pickle Filling Machine, Lime Pickle Filling Machine, Mixed Vegetable Pickle Filling Machine and Semi Automatic Pickle Filling Machines. We are manufacturer of Chikki Making Machines, at present mostly Chikki are made. It is difficult to maintain uniform quality cutting and thickness of Chikki. Considering the above problems we have designed advanced Chikki Rolling Machine in which, semi-solid Chikki material is spread and gradually rolled out into required thickness by four stages and lastly cut into even pieces of required size. In addition, the complete process requires very less power consumption. Therefore, this turns out to be very beneficial in comparison to traditional methods. Hand process requires much hard work and time so two workers can at the most prepare 50 to 60 kg in eight hours. However, in Semi Automatic Chikki / Kaju-Katri machine four workers can easily prepare 300 kg to 500 kg in 8 hours. We, bring the foremost manufacturer and exporter in the industry of food processing equipments, brings forth for our clients an exclusive stock of Besan Kadai Machine. In order to make the machine safe for food items, all the contact parts in it are constructed out of food grade 304 type stainless steel. There are mild steel angled frames structures for supporting the machine. 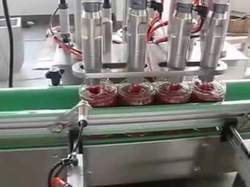 Filling machines and packing machines fill containers such as bags, bottles, and cans with a predetermined volume of product, such as food, cosmetics, or medicine. Be used for filling with particulate matter sauce,paste,jam,liquid and other material; Some of the materials used 316L stainless steel; Full pneumatic control, easy to operate, remove and clean; Ideal equipment for filling inflammable, explosive materials. Our raw mango cutting machine is indigenously manufactured. It cuts mangoes in maximum square pieces. It has build in conveyors at out-put end. It is compact in size & easy for working. It is in available in various models. This machine is useful for Half cutting of Raw Mangoes, Lemon, Carrot. The structure of machine is built in Mild steel while food contact parts are made up of S.S.304. User friendly designed and developed especially for the Pickle Manufactures for Fine Cutting of Raw Mangoes. 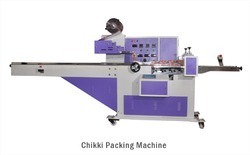 Chikki Packing Machine is preferred by our customers for its low operating cost. The special features of this Chikki Packing Machine are its high efficiency level, low energy consumption and simple maintenance system. We are supplying Oil Pouch Packing Machine to our valued customers. Our experts have brought forward these machines in accordance with the industry laid parameters and thus, are capable of delivering excellent performance. Pouch Packing Machine produces a large number of packing solutions of different Application. This is helpful for manufacturer to save time, labor cost, technically fitted product available in attractive packing, pouch packing attract customer attention. Pouch packing product has all information regarding product detail, company detail, method to use product. Pouch packing machines provide hygienic product packing. Pouch packing manufacturer are high quality product and marginal cost. It has customized service facility also so that customer can get timely service also for continuous performance of packaging machine. 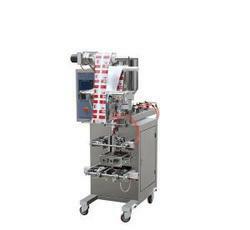 Pouch packing machine price are low compare to other competitor. We are specialized for pouch packing for Kurkure, nankeen, Chips, Powder, Masala, Haldi, Granules and Tea. 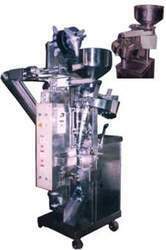 Pouch Packing Machine is never comprised with quality and price. Our form fill and seal machines ensure long life and better quality products that meet the international standards. 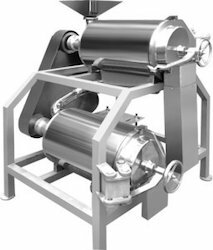 Our range of form fill seal machines includes BM 330 and BM 330 (W).It is used to pack free flow granules as Tea,Coffee, Spices, Rice,Pulses, Nuts,Candy,Dry Fruits,Namkeens,Snack etc.